Chickenpox (varicella zoster) is a highly contagious viral illness that occurs mainly in children. In the UK, primary infection peaks in winter and early spring. The condition is characterised by the presence of a generalised, pruritic rash that develops into vesicles, pustules and finally, crusts. The mainstay of treatment is supportive care. 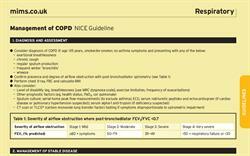 This includes adequate oral fluids, antipyretics and observation of possible complications. Severe complications are rare in chickenpox. The condition develops latency in the dorsal root ganglion after primary infection; reactivation can occur at any time throughout life, in the form of shingles. In the UK, primary infection has a peak incidence in winter and early spring. In England and Wales, incidence is 1,290 per 100,000 person-years. Chickenpox is common, so most pregnant women exposed to the virus are immune and only three in 1,000 pregnancies are complicated by primary infection. Varicella can develop at one to 16 days of life in infants born to mothers with active varicella around the time of delivery. Chickenpox is one of the most contagious childhood infections and the household attack rate for non-immune individuals who come into close contact is about 90%. School contact tends to be lower, at 12-33%. The virus is spread by direct contact or airborne droplets followed by mucosal invasion of the upper respiratory tract and conjunctiva, or direct contact with infected vesicles. Primary infection causes chickenpox. Asymptomatic infection is unusual, but some cases are mild and go unrecognised. The primary viraemic phase is followed by a secondary viraemia to the skin and mucosal surfaces. Children are contagious from one to two days before the onset of the rash until all lesions have crusted over. The incubation period is 10-21 days, but most children usually become ill 14-16 days after contact. However, the incubation period can be much shorter in immunosuppressed patients, or longer if the child has received varicella zoster immunoglobulin (VZIG). Each child in a family who develops varicella tends to have sequentially worse disease, with the final child being the most unwell. 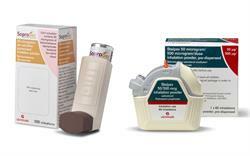 Young infants, adolescents and adults tend to have more severe disease, with a higher rate of complications. The current two-dose schedule provides 98% immunity for children and 75% immunity for adolescents and adults. Breakthrough infection in both groups is milder, with fewer lesions and systemic symptoms than unvaccinated individuals. Reinfection is rare and vesicular rashes in childhood are often difficult to differentiate in the early stages. A detailed medical history is vital in cases where the diagnosis is uncertain, and establishing recent exposure to varicella can be helpful. Accurate and prompt diagnosis is important so that parents can be counselled about contact avoidance and symptom relief. Hospital admission should be avoided wherever possible, to avoid unnecessary nosocomial outbreaks. Chickenpox is usually distinctive, but other causes of vesicular rash include herpes simplex (not usually disseminated), herpes zoster (usually dermatomal), hand, foot and mouth disease (Coxsackie virus), enterovirus, impetigo and syphilis. Adolescents with the condition may complain of a prodrome of nausea, myalgia, headache and loss of appetite, but symptoms in younger children are usually non-specific, although fever is practically universal. 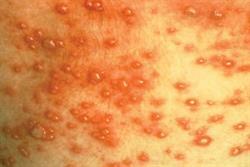 The classical sign of chickenpox infection is the generalised, cropping vesicular rash and intense pruritus. The rash is seen mostly on the head and trunk, but can occur in any area of the skin and conjunctiva. The rash appears in crops, with new lesions occurring for three to six days following the primary lesion. Most lesions will heal without scarring and the disease resolves within about one week of symptom onset. In immunocompromised children, including those with HIV or taking long-term steroids, progressive, severe varicella can develop. This is characterised by high fever of long duration, continuing eruption of cropping lesions and the appearance of complications. In some cases, despite adequate treatment, the disease can be fatal. Haemorrhagic varicella, with bleeding into and around lesions, is also seen, but is rare. 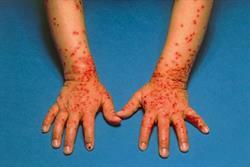 It is not usually necessary to carry out any investigations in a child who has chickenpox but is otherwise well. In cases where the diagnosis is unclear or has implications for other family members, or in pregnant women, detection of viral DNA from vesicular fluid by PCR has the highest sensitivity. The mainstay of treatment for patients with chickenpox is supportive care. This includes provision of adequate oral fluids and antipyretics, and observation of possible complications. There is now some evidence that overwrapping can lead to worse disease eruptions, so parents should be advised to keep their child cool. 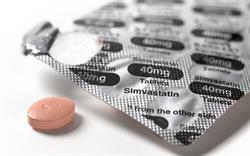 There is controversy about whether the use of NSAIDs increases the risk of necrotising soft tissue infection and invasive group A streptococcal infections associated with chickenpox infection.2 It is not advisable to use ibuprofen as an antipyretic in chickenpox because of the possible association with these complications. Salicylates should also not be used, because of the increased risk of Reye's syndrome. Aciclovir is the only drug licensed for varicella in children. Studies have shown that it can shorten the disease course by approximately one day of fever and rash. Some experts recommend oral aciclovir for non-immune household contacts, because they are likely to develop more severe disease. Aciclovir is only effective if given within 48 hours of the rash eruption, because viral replication ceases 72 hours after the first vesicles appear. 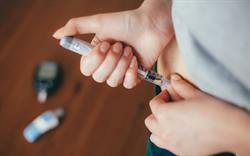 It should only be given to adolescents and adults, and should not be routinely prescribed in otherwise healthy children over one month of age, in whom the disease is likely to be mild. Immunoglobulin is not effective once the disease is established, but should be considered in neonates and immunocompromised patients. This takes the form of IM VZIG or IV immunoglobulin (IVIG). Immunoglobulin should ideally be given within 96 hours of significant exposure and not delayed past seven days. 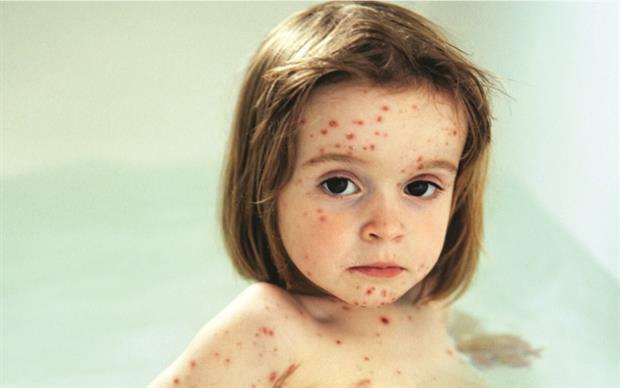 Most children with chickenpox can be managed in the community. Parents should also be advised as follows. For exposed, non-immune patients, contact precautions should continue for 10-21 days after exposure to the index patient (up to 28 days for neonates or a child who has had IVIG). Public Health England defines exposure as residing in the same household, maternal/neonatal contact, contact in the same room for >15 minutes and kissing contacts. The most common reason for hospital admission is secondary bacterial skin infection with group A streptococcus or staphylococcal infection, more commonly seen in children who also have eczema. 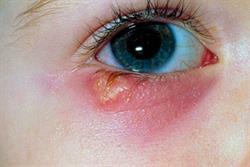 This is characterised by increasing fever with redness and pain around the original lesions. 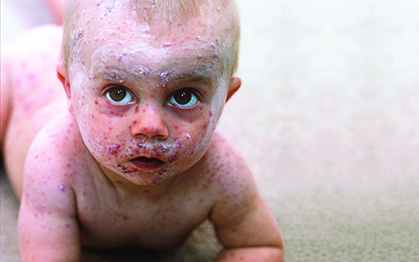 Other potential complications in patients with chickenpox include pneumonia, encephalitis, cerebellar ataxia, toxic shock, purpura fulminans and necrotising fasciitis. Any child who develops a fever that lasts for more than five days after the rash onset should have a medical review to rule out the possibility of bacterial infection. Non-immune pregnant women who come into contact with varicella are at risk of developing in utero infection, leading to congenital varicella syndrome, or of contracting severe disease themselves. Infection of the fetus in the first 20 weeks of pregnancy can cause fetal death or congenital varicella syndrome, characterised by limb abnormalities and skin scarring. There may also be CNS and eye involvement. If the fetus is infected in utero during the second 20 weeks of pregnancy, the infant can develop subsequent herpes zoster infection in early life without having previously developed obvious chickenpox. In newborn infants, varicella can be fatal if the mother develops the disease at any time from five days before to two days after the delivery. If varicella develops in the mother more than five days before delivery and the gestational age of the fetus is above 28 weeks, the child should be protected from the condition by maternal specific IgG antibodies. Neonates are at higher risk of fulminant chickenpox or haemorrhagic varicella, so if the mother develops primary infection at term, there is a significant risk to the infant. A previously healthy three-year-old child develops fever and coryzal symptoms that worsen over a few days. His mother takes him to see the GP when she notices vesicles on his torso. These are intensely itchy and there are a few pustules developing. The child has mild eczema, but no sign of secondary skin infection. On examination, the child has a spreading vesicular rash in crops on the face and torso, with a few vesicles on the arms and legs. Several of the lesions are umbilicated and a few pustules appear to be crusting over. The child is diagnosed with simple resolving chickenpox and his mother is advised to keep him away from nursery until the vesicles have crusted over. 1. Heininger U, Seward JF. Varicella. Lancet 2006; 368: 1365-76. 2. Zerr DM, Alexander ER, Duchin JS et al. A case-control study of necrotizing fasciitis during primary varicella. Pediatrics 1999; 103: 783-90. 3. Tebruegge M, Kuruvilla M, Margarson I. Does the use of calamine or antihistamine provide symptomatic relief from pruritus in children with varicella zoster infection? Arch Dis Child 2006; 91: 1035-6. 4. Goldman GS, King PG. Review of the United States universal varicella vaccination program: herpes zoster incidence rates, cost-effectiveness, and vaccine efficacy based primarily on the Antelope Valley Varicella Active Surveillance Project data. Vaccine 2013; 31(13): 1680-94. Hambleton S, Arvin AM. Chickenpox party or varicella vaccine? In: Pollard AJ, Finn A (eds). Hot Topics in Infection and Immunity in Children II. London, Springer, 2005. NICE. Clinical Knowledge Summary: Chickenpox. London, NICE, September 2014. Royal College of Obstetricians & Gynaecologists. Chickenpox in Pregnancy. Green-top Guideline 13. London, RCOG, 2015.